This animal alphabet design is perfect for babies and toddlers. The background consists of animals associated with all 26 letters of the alphabet. A for Alligator, B for Bear, C for Cat - all the way to W for Whale, X for X Ray Fish and Z for Zebra. We chose a white background for our design - however the background is re-colorable and also looks great with any pastel color. We chose baby blue ribbon with stitching and a round label. 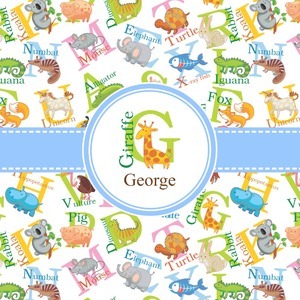 For personalizaton we chose the G for Giraffe and George! With us, you always have a choice of many different colors, label and ribbon styles. For personalization, you can chose the animal alphabet associated with the initial (see image) or you can just choose the animal or you can select a completely different style such as a monogram or a name & initial. You can try our the various combinations in our customization system to see which combination you like the best!